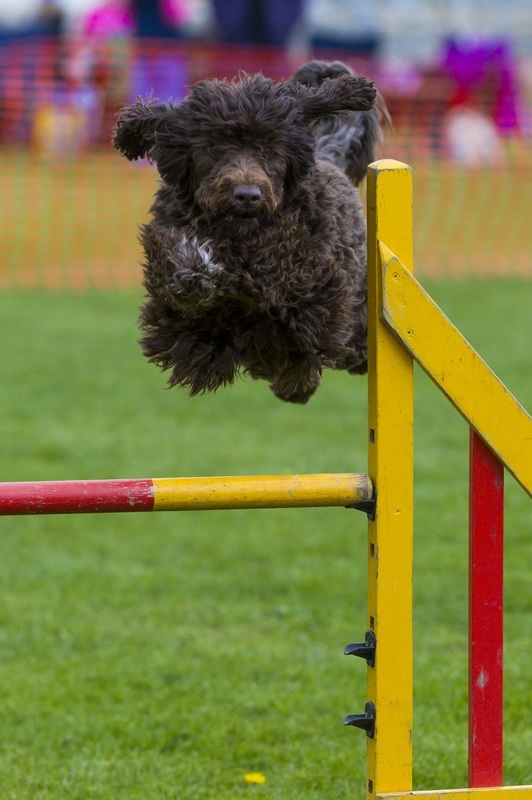 Portuguese Water dogs are an athletic breed that requires a lot of exercise. Although they are loving and loyal, they are not a breed for everyone. If they do not get exercised on a daily basis, they can become very destructive out of boredom. Portuguese Water Dogs are a highly intelligent, spirited, and strong-willed breed. They are fast learners and eager to please. The are a great breed for obedience, agility, water work, and search and rescue, to name a few activities that they excel in. The Portuguese Water Dogs is known as a hypoallergenic breed. They are low shed and low dander, but people can still be allergic to them (or any hypoallergenic breed). Always meet the breed first before committing to buying a puppy. The coat colors are black, brown (in various shades), or white. They also come in black & white, and brown & white. There are two coat varieties, wavy or curly. Both coat types require daily brushing and regular trips to the groomer. Portuguese Water Dogs are a medium breed. The weight ranges from 42-60 pounds for males and from 35 to 50 pounds for females. The height at the withers ranges from 20-23 inches for males, and 17-21 inches for females. As with many dog breeds, Portuguese Water Dogs also have some health issues that you should be aware of. We can test for some of these diseases, and there are others that are still being researched. HD is an improperly formed hip joint. It occurs in pure breed and mixed breed dogs alike. It can only be diagnosed by an x-ray. The Orthopedic Foundation for Animals (OFA) is an organization will evaluate hip x-rays for signs of hip dyslasia in dogs 2 years and older. Once evaluated, the dog will receive a permanent certificate, an OFA number, and a rating of excellent, good, or fair. Dysplastic dogs will not receive a number, and the degree of dysplasia will be rated mild to severe. Prior to breeding, dogs should have their evaluated by the OFA. Only dogs receiving an excellent, good, or fair should be bred from. Please note that breeding 2 dogs with excellent hips will not guarantee that all of the puppies will have excellent hips. Elbows can be x-rayed too. They are rated normal, or not normal. PRA is an eye condition that eventually causes blindness, which unfortunately there is no cure. Affected dogs can be either identified by a genetic test or an eye exam as an adult. The test, performed by OptiGen identifies dogs as Normal/clear, Carrier, and Affected. Carriers will never become blind from PRA, only affected dogs. In addition to the OptiGen test, Portuguese Water Dogs used for breeding should have their eyes examined annually by a Board Certified Veterinary Ophthalmologist to ensure the overall health of the eyes. Improper Coat is an recessive inherited trait that causes changes in the coat. Affected dogs have a short coat on the head, face, legs, and muzzle. These dogs will look similar to flat coated retrievers or border collies, and they can shed. There is a genetic test for IC that identifies the dog as normal, carrier, or improper coat (affected). Juvenile Dilated Cardiomyopathy is an inherited, recessive disease of the heart that is fatal. It causes the heart to enlarge. JDCM affects puppies 6 weeks to 7 months of age. Affected puppies can die suddenly or develop lethargy, breathing difficulties, and inappetence. There is no cure for this disease. There is a test available that identifies dogs as JDCM clear/normal, or carrier. Addison’s disease (hypoadrenocorticism) results from a reduction of glucocorticoid and mineralocorticoid secretion from the adrenal gland. This affects metabolism and electrolyte imbalances in the body. Symptoms of Addison’s include weight loss, vomiting, weakness, collapse, depression, and excessive shedding, and death. Symptoms can be triggered by stress. Once Addison’s is diagnosed, it can be treated. Despite extensive research to locate the mode of inheritance, there is no genetic test for Addison’s presently. GM-1 is a recessive storage disorder that is fatal. Affected dogs rarely live past 6 months. The disease affects the nervous system causing ataxia, blindness, seizures, and changes in behavior. There is a DNA test available through OptiGen that identifies dogs as Normal/Clear, Carrier, and Affected. Carrier dogs do not show signs of the disease and can be bred to Normal/Clear dogs.